IBT stocks a wide-variety of Rubber and PVC belts from 120 PIW to 800 PIW with compounds to meet your most demanding environments in the grain handling industry. Slitting and punching capabilities up to 84 inches wide. Call IBT today for grain conveyor and bucket elevator belting, fabricated to your application’s specific requirements. Choose from a variety of static-conductive, oil-resistant and fire-retardant heavyweight belts, rated for internal grain elevator and grain conveying applications. Belts are OSHA compliant, meeting standard 1910.272(q)(2) for Static Conductivity and MSHA 30 CFR 18.65 for flame resistance. PVC and PVG belting is the heavy-duty, economic alternative to meet your demands. IBT’s PVG selections meet OSHA and MSHA standards for static conductivity and flame resistance. As well as utilizing compounds to provide moderate oil resistance. IBT offers a comprehensive range of belt profiles to help you achieve optimum performance. All profiles are integrally molded into the belt. 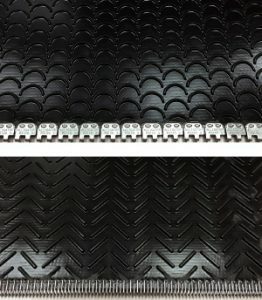 Continuous Chevron — The triangular continuous chevron also makes this pattern an excellent choice for efficient high incline tube style conveyors. Mini-bite — Great for handling fine bulk material such as grain, nut shells, sawdust, etc. V-Cleat — Wide V pattern allows for product traction, exceptional wear resistance for moderately aggressive incline grain conveyors. Rough Top — Commonly used for Incline bag and package handling applications, also suitable for pulley lagging. Diamond Top — Commonly used for Incline bag and package handling applications. FDA and USDA approved PVG belt is stocked at IBT. PVG white cover, food-grade belting is first-rate for flour mills and conveyors with FDA requirements. PVG black cover belt also meets FDA requirements. The PVG belt is built with MOR compounds so that it minimizes the adverse effects of oily grains. In addition, PVG belting has low stretch and high bolt-retention ability. This is IBT’s best-selling belt for warmer climates. It is the economical choice for moderate oil and mild ambient temperature applications. Fenner Dunlop – For more than 150 years, Fenner Dunlop has been a leader in some of the most significant and technologically advanced conveyor belt innovations. The Fenner Dunlop Grain Master™ line of belts provides superior rip and tear resistance coupled with superior bolt retention properties. Applications include: grain elevator belting, feed silos, milling and other applications requiring durability, oil and cold temperature resistance. Flexco – When it comes to selecting the best conveyor accessories, Flexco’s high-quality cleats, pulley lagging, fabrication, belt splicing and maintenance products are designed to maximize productivity. The Flexco Everdur Plate Splice System offers a strong, sift-free splice to protect against seepage of fine materials and moisture. The Flexco Everdur Hinged fastener system offers a strong, non-sparking splice required where trough ability and smaller pulley diameters are present within the conveyor system. The IRPG team at IBT Industrial Solutions custom-fabricates and services conveyor belts every day—offering both heavyweight and lightweight options—for all types of industries. They also cut and crimp a wide variety of industrial hydraulic and pneumatic hose at our KC Hose Shop facility, which is STAR-certified facility, exceeding criteria for cleanliness and hose safety. We’ve got the inventory and expertise to service all your belting and hose needs. For more information about grain conveyor or elevator belting, contact Tim West, IBT’s Industrial Rubber Product Group Director, today!